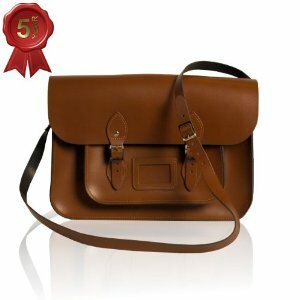 A couple of weeks ago I blogged about my love of a good vintage style satchel. I tweeted and generally shouted and I was followed by lots of other satchel types. Then I came across The Leather Satchel Company and as they have been handcrafting satchels in the UK since 1966 I became all nostalgic at the thought that my beloved old (lost) satchel may actually have once passed through their doors. Now I love my fluro green satchel but my macbook doesn't fit inside and as I'm rarely (make that never) without my mac it's a bit more fashion over function. So with the love of my mac in mind I decided a more practical satchel was needed. The satchel world really is your oyster. But what did I opt for? Bright CyberMummy pink, with my initials monogrammed (to stop my girls stealing it) and in the perfect size for my equally loved macbook. My pic really doesn't do justice to the colour. It's the brightest pink I have ever seen. One thing's for sure though, you really won't miss me! The Leather Satchel Co offer a unique 5 year craftmanship guarantee on their bags, so if your stitching is wearing, or a buckle is giving in they will replace or repair free of charge. It doesn't really get any better than that - well I don't think so. Check out their website, this vintage 15" beauty is currently £75.60. Wow! That pink is amazing, love it! whats wrong with the pink???? You wait till you see it in the flesh @Muddling Along you will be all over it! Love a good satchel! Being a high street girl, Primark have the coolest neon pink mini satchel with brown leather strap! i am so jealous, I want one!! <3 i'm on the hunt for a cambridge satchel in fluoro pink (i already have an orange). i read a review that said the leather satchel's were better. your thoughts (since you have both)? thanks! I would say that The Leather Satchel's are better quality - but opt for the longer than standard strap if you like to wear it across your body. Cambridge satchels have longer straps as standard. i just saw your reply -- thanks! 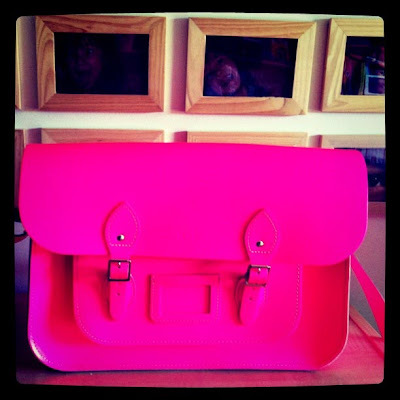 would you say the leather satchel's neon/dayglow pink differs from the fluoro pink of cambridge satchel?